Horse and wagon on Main Street, Bodie, Ca, 1880 at West and Bryant Store Hardware, General Merchandise. Photo by R.E. Wood. www.Bodie.com "A Birdseye view of the mining district and the town of Bodie, Mono County, Cal." Sign board from a mining company who was preparing to turn Bodie Bluff into a pit-mine. After much hard work by many dedicated volunteers and State Park employees (and the fact that Galactic Resources went bankrupt trying to clean up a cyanide spill it caused), the bluff was saved. 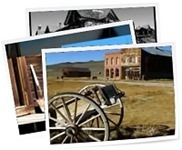 The land 'behind' Bodie is now part of the State Historic Park. "Bodie Project Exploration Office - Bodie Consolidated Mining Co. Inc. - A subsidiary of Galactic Resources"
"BODIE - Gold was discovered here in 1859 by W. S. Bodey after whom the town was named. Once the most thriving metropolis of the Mono country, Bodie's mines produced gold valued at more than 100 million dollars. Tough as nails, "the bad man from Bodie" still carries his guns and bowie knife down through the pages of western history. - California Registered Historical Landmark No. 341 - Plaque placed by the California State Park Commission in cooperation with the Mono County Department of Parks and Recreation and the Mono County Historical Society. - September 12, 1964"
Or, click here to see all images tagged as “Signage”.